EGU Blogs » GeoLog » Record-setting forest fires in 2017 – what is to blame? Record-setting forest fires in 2017 – what is to blame? Styggkärret reserve burning fire . Credit: Ylvers , distributed via Pixabay . Forest fires have once again seized the public consciousness in both Europe and North America. Extreme drought and temperatures contributed to a tinderbox in many forests, and have led to deadly fires across Europe and record-breaking, highly disruptive fires in the USA and Canada, from where I’m currently writing. A simple way to understand fire is by thinking about the fire triangle – the three pieces that need to combine to produce fire: heat, oxygen, and fuel. While the concept of the fire triangle offers simple insights into the cause of a fire, each of the three factors are subject to a number of controls. The availability of fuel in particular is affected by a whole range of influences, from tree species variations, to the impact of pests, to the prior history of wildfires. In many cases there will be a multitude of reasons for both the rate that a given fire spreads, and the spatial extent to which it burns. The extensive media coverage of this year’s record-breaking fire season provides a useful opportunity to explore some of these factors, and how they might have contributed to the fires that we’re seeing this year. Not all forest fires are equal. The forestry service in British Columbia defines 6 different levels of fire, ranging from slow burning of peat below the surface of a forest (a ground fire), through the burning of scrub and ground level debris (surface fire), to far harder to control conflagrations that consume the canopy of the trees (a crown fire). Each type of fire consumes fuel from different levels of the forest, and a transition from a lower to higher level requires at a minimum that there is enough flammable material in the upper layers of the forest. As such, the history of fire in a given stand of woodland will have a significant effect on the potential for future fires; a prior surface fire could remove the under-brush and limit the future fire risk. Many older trees in a forest can have fire scars from previous, smaller fires that have not burnt them entirely, demonstrating that not all fires make the transition to crown fires. In the US, the largest 2-3% of wildfires contribute 95% of the total area burned annually, and these are generally the largest crown fires. For these large fires, the conditions must be optimal to reach the canopy, but once they make this transition they can be very difficult to stop. “Once ignited, decaying logs are capable of smouldering for weeks, or even months, waiting the time when prevailing conditions (hot, windy, and dry) are conducive for expansion into a full-blown forest fire,” write Logan & Powell in 2001. The initial trigger in natural settings for the fire is generally lightning, or in rare cases the intense heat from lava flows. However, a recent study has shown that in the continental US, 84% of fires are started by humans. This can range from discarded cigarettes to prescribed fires that have raged out of control. So, we now have a simplified understanding of the requirements for a fire, but perhaps the more important question remains: why do they spread? So what are the processes that control the strength and spread of a fire? Certain aspects, like climatic conditions, tend to set a long-term propensity for wildfire, while other short term effects define the local, immediate cause for a fire. 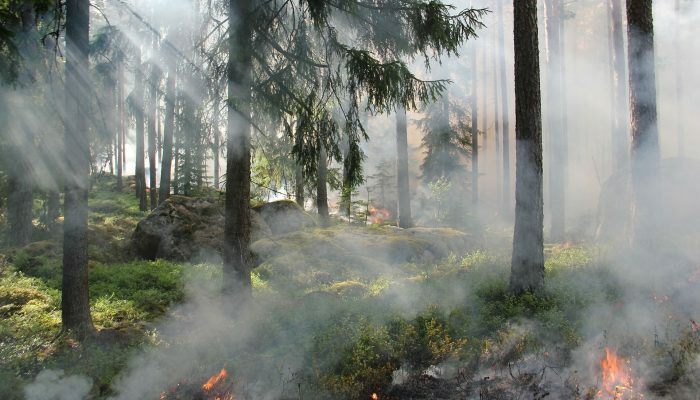 The importance of temperature at a global scale is demonstrated by studies suggesting that fire outbreaks have systematically increased since the last glacial maximum 21,000 years ago, when average temperatures were several degrees colder. So once the climatic conditions set a long term likelihood for a fire to break out, as well as the distribution of tree species (and therefore the amount of fuel), short term disturbances can act to further increase susceptibility. We can divide these more immediate factors into weather, ecological, and human influences. Unsurprisingly, weather conditions that bring hot, dry weather with the chance of thunderstorms will be highly likely to drive fires. A number of studies have shown that this kind of weather is often linked to persistent high pressure systems in the atmosphere, which push away rainfall, and can last for weeks at a time. This kind of atmospheric conditions can often be linked to longer term weather patterns, in particular El Niño, and the effects can be long-lived. For example, El Niño brings warm, dry weather to the North-western part of North America, driving increased fire. In the South-west, El Niño brings wetter weather, but the increased vegetation growth provides a larger amount of fuel that can then burn in subsequent drier conditions. The growth of plants is just one way that the forest ecosystem can affect the availability of fuel for fire. Many trees are affected by pests. 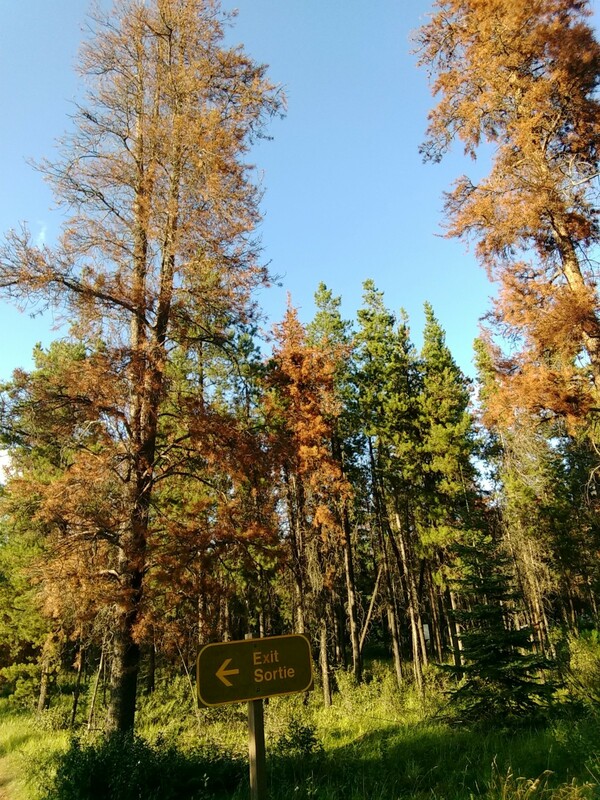 The classic example is the pine beetle, which can kill so many trees that whole swathes of pine forest are left characteristically red as they decay in the aftermath of an infestation. While some studies have shown that this can reduce the chance of a crown fire (since less fuel is available in the canopy), the dead and decaying trees provide a source of drier fuel at ground level that is a concern in many regions. Elsewhere, we can see cases where trees encourage fire. Eucalyptus trees contain oil that burns strongly; the fire that this produces is suggested to remove the other tree species competing with the Eucalyptus. A strange method, but no doubt effective! The Eucalyptus, introduced to Portugal by humans in the 18th century, has been linked to many of the deadly fires that occurred there this summer. The lodgepole pine, too, has pinecones that require the heat of fire to open and release their seeds. As such, fire is a natural part of the ecosystem, and in most areas of the boreal forest fire management is limited, with attempts at suppression only made where human settlement is at risk. Where humans do step in, their actions can have an important role in setting the overall susceptibility to fire. Creating ‘fire breaks’ by felling or controlled burning of woodland in the path of a fire removes fuel and limits the growth of a fire, and a program of controlled burns is an important part of forest management to limit the potential for future fire by clearing scrub vegetation at the surface. On the other hand, continual suppression of fires can lead to build up of fuel – which can then form a significantly more dangerous fire on a long term basis. Ken Lertzman, Professor of Forest Ecology and Management at Simon Fraser University, told me that in general, control mechanisms are only useful for smaller surface fires; once the fire reaches the canopy, fire suppression is extremely difficult. “It’s a combination of a statistical and philosophical problem”, he says. Fire control is expensive, so unless it’s financed by profits from felled lumber, cost benefit analysis is necessary, based in part on the statistical probability of a huge fire breaking out in a given location. Philosophically, though, “management forest stand structure at the boundary conditions [between surface and canopy fires] may be able to keep small fires becoming extreme.” and thus perhaps it’s worth trying to use control mechanisms even if giant canopy fires would ignore them, just to avoid that transition to the canopy. As with most natural systems, the factors discussed above don’t necessarily act independently. Many can amplify other effects. For example, the geographical range of pine beetle outbreaks could increase under a warming climate. At a smaller scale, giant fires can create their own weather patterns, acting to dry out the surrounding forest even before it ignites. So, is the greater incidence of fire this year down to this kind of combination of factors? 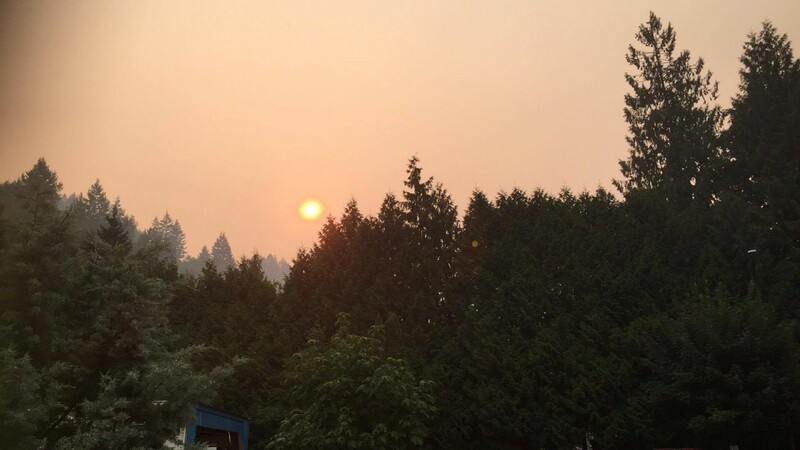 The sun at 10.15 in the morning in Chilliwack, BC, 3rd August 2017 – more than 50km from the nearest fire. Credit: Megan Reich. The summer of 2017 has been brutal for wildfire in many locations. Europe has been hit hard with more fires in one day in Portugal than any previous on record. In British Columbia (BC), the largest single fire on record is currently burning, contributing to the largest total area burned in historical record. The fires released so much particulate matter and haze that the sun was obscured in large parts of BC. According to Professor Lertzman, in British Columbia at least, this is “a fire year different in degree, not in kind”. The same processes are at play as always, but in overdrive. An early spring thaw combined with a long, hot and dry summer created the ideal antecedent conditions for fire. Linking individual intense ‘fire years’ to long term climate change in challenging, but it is likely that these kind of conditions would be more likely to occur in a world influenced by anthropogenic climate change. Years like this one, which are clearly exceptional compared to the long term trend for fire, might begin to occur more often; every 5-10 years rather than every 30-50, for example. In the short term, fire damage and suppression is expensive, both financially and in terms of lives affected. Smoke is a health risk to wide areas in the face of such intense fire, but ecological damage can be more difficult for humans to see. Mature forest is a different niche for organisms to fill in comparison to fresh surfaces stripped bare by fire. While each ecosystem has its place in the natural forest, an increased prevalence of fire reduces the mature forest available for the species that prefer that ecological zone. These can range from recognisable mammal species such as bears, deer and caribou, to less well-known but still important canopy lichen species, says Professor Lertzman. While this year’s fire season is beginning to ease off, it is clear that the range of factors, both natural and those driven by humans, will continue to play a role in years to come. More build-up of infrastructure in developed countries puts more human settlement at risk, so a clear understanding of how fire interacts with the climate, weather, and forest management strategies will be vital to allow us to live alongside fire in the future with fewer problems. Ford, B., Burke, M., Lassman, W., Pfister, G., and Pierce, J. R.: Status update: is smoke on your mind? Using social media to assess smoke exposure, Atmos. Chem. Phys., 17, 7541-7554, https://doi.org/10.5194/acp-17-7541-2017, 2017. I live in Central Portugal and we were at the epicentre of many of the June fires, which wreaked such natural and human damage. It all happened again farther to the east and north in October. More than 100 people have perished, hundreds of homes have been lost, and much else. Government here is passing all sorts of directives about fire prevention, better evacuation systems and so on. But…nobody to my knowledge has revealed how many cubic tonnes of carbon were realeased into the atmosphere by these fires. And I think we all need to know! Many of us want to push for policies that will mitigate this awful pollution, but we must have accurate figures about the actual environmental damage so that we can make our point to the authorities. Can you help? Who has these figures?